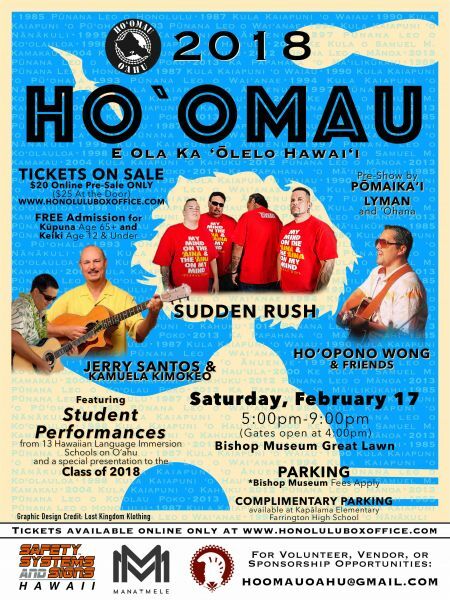 The “Hoʻomau” concert was first produced in 1986 to support the first Hawaiian language Immersion school on O’ahu, Pūnana Leo o Honolulu. Since then, Hawaiian Language immersion education has grown to include 4 more Pūnana Leo and 8 Kula Kaiapuni throughout O’ahu. Because of the efforts of parents and teachers in producing this annual concert, our keiki have been able to benefit from more enhanced learning as well as the opportunity to continue their Hawaiian-medium education through graduation. In the past, “Ho’omau” has continued to serve as a financial support to all participating schools. Recently, it has grown to be a celebration of heritage. Here, students have a chance to reconnect with teachers and classmates from younger years as they present their song and dance. Families have a chance to understand the importance of their role in supporting these students. Visitors get a glimpse of what it means to not only be Hawaiian, but also to live it through the language and traditions of our kupuna. “Hoʻomau Oʻahu” is a time where we share in the accomplishments of our keiki, ‘ohana, and kupuna of reviving the language of our Hawaiian people. The vision of our founders has become clear for all to see: E ola ka ‘ōlelo Hawaiʻi. will be used to support all participating schools.